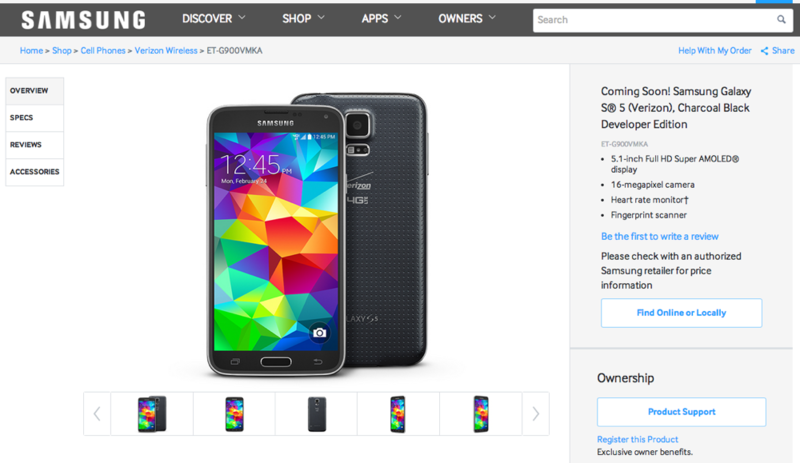 Tinkerers, a developer edition of the Samsung Galaxy S5 is on the way and it’ll work on Verizon’s network. Like past Galaxy devices that fall under the “developer edition” tag, it’s only marked as coming soon and without a price tag, even though today is the global launch day. Most carriers are selling the device at full retail (which is how you’ll have to buy this) for either $599 or $649, so set at least that much cash aside if this is the phone for you. As far as a potential availability date, I’d give it at least a couple of weeks, maybe even a month. For those not familiar with the developer edition series, just understand that this is Samsung’s attempt to appeal to those who like unlockable bootloaders and the freedom to do as they please with a phone (like flash custom ROMs). Unfortunately, these phones don’t always see the best support in terms of updates. You are paying a premium for a device with an unlockable bootloader, and that’s about it.